We have seasoned veteran contractors in each department of our company, and each of our home improvement departments are run by an Dix Hills Exterior Services contractor that has worked extensively in their specialized field for at least ten years. At Nassau Suffolk Exteriors, we stand behind our work with the best guarantees in the business: a Three Year Guarantee on Workmanship. This means that if you ever happen to encounter a problem with our installation of your Dix Hills vinyl siding or replacement windows, we will be there to fix it! 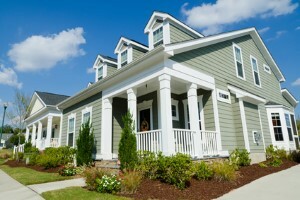 Vinyl siding is a very popular, maintenance-free siding material that comes in a multitude of colors and styles. Dix Hills vinyl siding is impact-resistant, strong and rigid. Another advantage of vinyl siding is that it cannot get termite-infested, nor will you encounter moisture issues such as the rotting that can occur with wood siding. It also requires low maintenance, since it does not need to be painted. Not sure how vinyl siding will look on your home? Sit down with one of our knowledgeable sales team members to discuss your home improvement project and view digital photos of our completed renovation projects on one of our four large monitors. You can also sit down with one of our experienced designers to have your project digitally rendered in 3D to see what your completed Dix Hills home improvement project will look like. Since we offer Dix Hills vinyl siding in a variety of widths, lengths, colors, shapes and textures, we are sure to have the style of siding you are looking for in your exterior home improvement project. If you are looking for a Dix Hills window replacement contractor, then you have come to the right place. Our Dix Hills replacement window contractors are dedicated to providing the best windows for your home. If you're looking for replacement windows, siding, or roofing services in Dix Hills, call Nassau Suffolk Exteriors at 631-462-1383, or fill out our online request form.